I wanted to develop a system where every time I do something it's because it brings me closer to my end goal. I realized I had to develop this system because I found myself performing tasks and saying yes to things that I ultimately didn't care about. I have dreams! I have goals! I swear! But in the past I really pushed them aside to do what was expected of me but now here I am. Unfulfilled, chronically depressed and anxious, pissed off that life didn't go my way. And ironically I'm getting questions and dirty looks from people asking if me "well if that's what you want to do how come you're not doing it". To that I say, SHUT UP SUSAN! You don't know me!! But she's right, because Susan (who may or may not exist) has been with me at work for the past few months. All she knows about me is what I do now. Susan doesn't know that I've limited myself, she wouldn't say I'm stuck in a situation that I can't change. All Susan knows, all she sees, are the choices I make day to day. That I come into work, get my coffee and go about my day. She sees me do that day and night and is probably assuming that this is what I want since I keep showing up. Because I think… I know at this point that I've been running on autopilot. Doing things because either it's just how it's been or it's what's expected of me. Which unfortunately, hasn't been beneficial in the long term. Like going back to school. Saying you're going back to school is like losing weight. Yes it's always great and people admire you for it. Susan: Way to go! You look great! But whether Susan did it through crash dieting or racking up massive student loan debt. Versus conscious lifestyle changes or a strategic academic plan with internships and scholarships. It doesn't make a difference to them. How we go about things matter and I was tired of going through these pitfalls. Not asking "why", due to outside pressures. In the end the regret was my own. Good news is today's a good day for a drastic solution that will change your life forever! False, in reality, radical lifestyle changes rarely last in the long term. The key is to make simple changes that can be practiced everyday and build up on as we progress. That you build up confidence, not only in yourself but also in path you are taking forward. In the end the changes are less noticeable in the day to day but overall given a few weeks or months we can see the benefits of our efforts. For this reason I decided to follow a proven principle to not only identify what my goals are set steps to reach them. But also to make sure I prioritize my tasks in order of what matters most of to me. The four quadrant time management system is something i've known about for a while. As I'm sure you don't know... Bridging the gap between knowing the right thing and doing the right thing can be challenging. I mean you know you should make your bed every morning, but it's not something we do all the time without fail. Well I've decided to finally put it into practice. Laying out my to dos not in a list but in a table where I have to decide what's between what's urgent and important. This way if someone comes to me with a fire to put out, it goes in box. 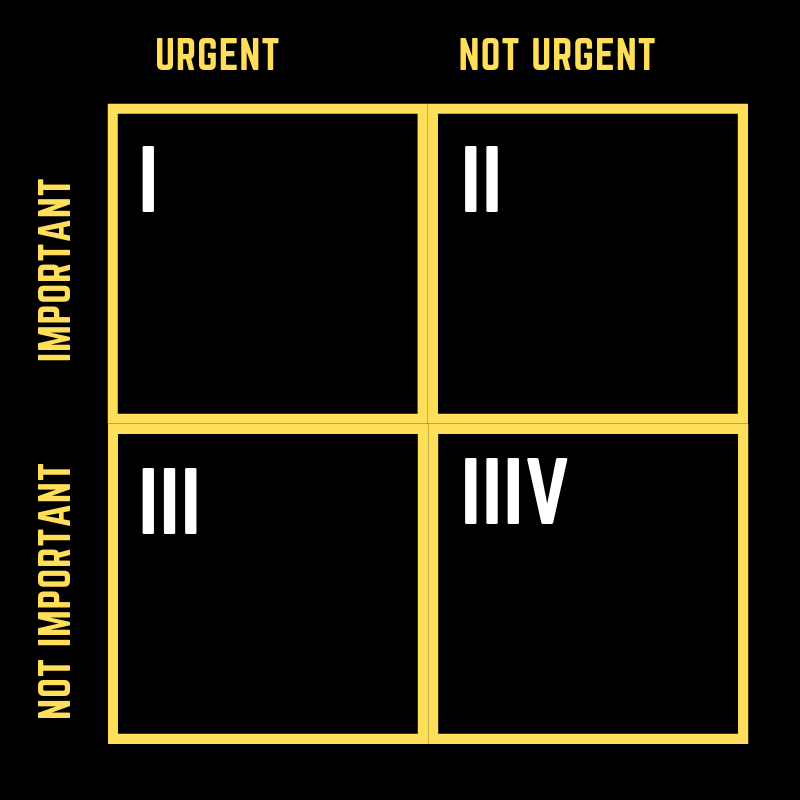 It may be urgent, but if it's not important it goes in quadrant three. Then I confidently say it's not a priority and follow through with the tasks in the first two quadrants. It may not be a drastic solution for life-changing results. But it does help simplify things and I'm alright with that. I'm sure Susan would be too.